A new investigation by People for the Ethical Treatment of Animals has cast doubt on the validity of the Responsible Down Standard, a widely vaunted chain-of-custody process designed to help companies source down from ducks and geese that haven’t been forced-fed or live-plucked for their feathers. As part of its exposé on Thursday, the animal-rights group released undercover video taken at nearly a dozen farms in China, which produces 80 percent of the world’s down for items such as outerwear, bedding, and sleeping bags. PETA’s footage shows workers pinning down struggling geese as they rip feathers from their raw and bloody flesh. At least two of the facilities investigators visited are connected to RDS-certified suppliers of brands such as Eddie Bauer, Lands’ End, and Hollander Sleep Products, PETA said. 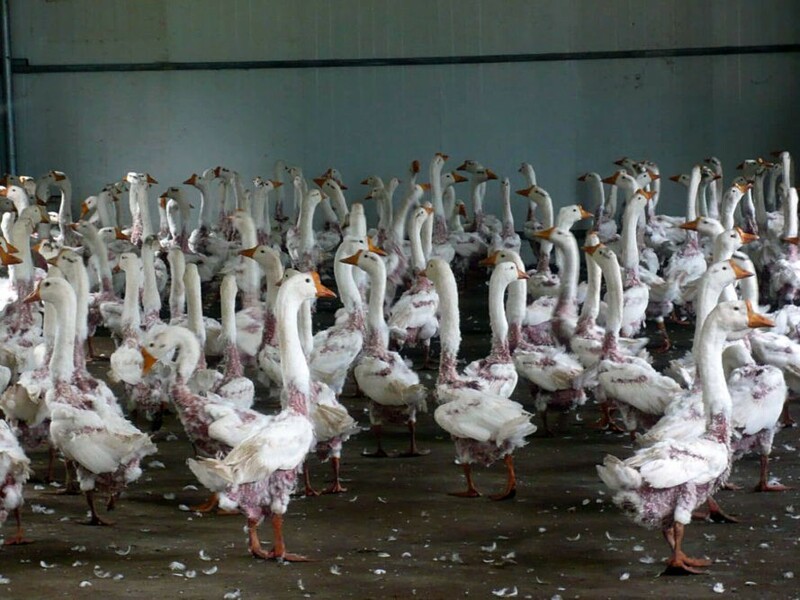 Teng Fei Goose Farm in Hebei, according to PETA, sells live-plucked down to the RDS-certified The Sea Feather, a Lu’an-based firm that offers a “non live-plucked products” guarantee. The Sea Feather supplies down to Hollander Sleep Products, which manufactures and markets down products for Ralph Lauren, Nautica, and Simmons. New White Goose Farming Cooperative, also in Lu’an, sells feathers and down to an intermediary that in turn sells to Allied Feather & Down. Allied, per PETA, supplies down to Eddie Bauer and Lands’ End, among other brands. Bailing sells down to the RDS-certified Down Decor*, another Eddie Bauer and Lands’ End supplier that claims to source its down from sources other than live plucked, PETA said. “As soon as we became aware of PETA’s investigation, we spoke with our certification bodies and certified suppliers in this region, and we have confirmation that no down from the PETA-investigated sites could have been sold as certified RDS down,” Worley told Ecouterre, before adding that PETA allegations could damage the momentum gained in the four years since the standard was established to protect and improve the welfare of ducks and geese. Eddie Bauer and Lands’ End, for their part, have denied purchasing live-plucked down. Similarly, Eddie Bauer CEO Mike Egeck notified PETA that the brand not only eschews live-plucked down for its products but that there is “no evidence” of live-plucked down in its supply chain. Still, PETA is asking consumers to petition down-using companies to ditch the feathers in favor of animal-free alternatives. This is just one of the reasons why I only buy vegan products. Synthetic fibers are warm, comfy, and stylish�and much more humane. I agree, this is sick and all these designers need to stop. I hope at some point people gain conscious to stop doing what they do to animals. Scary thing is that most of these people are women whom are doing the plucking. Not to mention it is in East Asia. A new investigation by People for the Ethical Treatment of Animals has cast doubt on the validity of the Responsible Down Standard, a widely vaunted chain-of-custody process designed to help companies source down from ducks and geese that haven�t been forced-fed or live-plucked for their feathers. As part of its expos� on Thursday, the animal-rights group released undercover video taken at nearly a dozen farms in China, which produces 80 percent of the world's down for items such as outerwear, bedding, and sleeping bags. PETA's footage shows workers pinning down struggling geese as they rip feathers from their raw and bloody flesh. At least two of the facilities investigators visited are connected to RDS-certified suppliers of brands such as Eddie Bauer, Lands' End, and Hollander Sleep Products, PETA said.